Browse one of the most significant collections of Western Art in the country, marvel at beautiful Native American pottery, and more when you visit the Stark Museum of Art in Orange. The art museum houses a stunning collection of works by distinguished artists and writers such as John James Audubon, Georgia O’Keeffe, and Charles Dickens. This collection resides in downtown Orange just steps away from the town’s other top attractions. If you’re an art fan or you’re looking for something fun to do in Orange, visit the Stark Museum of Art. The Stark Museum of Art started as an idea by H.J. Lutcher Stark, a prominent philanthropist who also founded the Shangri La Botanical Gardens & Nature Center. Stark began building his collection while he was still an undergraduate student at the University of Texas in the late 1920’s. Throughout the next few decades, he and his wife Nelda would add hundreds of other works of art, such as sculptures, paintings, and glassware. All of these items are displayed within the art museum’s four collections that you can see during your visit. 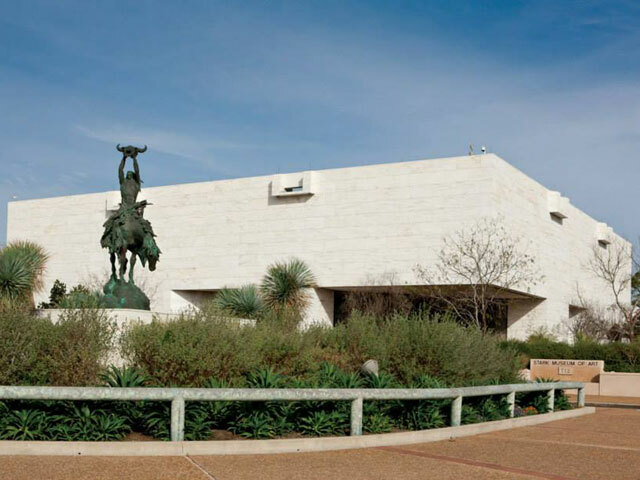 Your tour begins at the Western American Art exhibit, where you’ll see landscape and portrait paintings, photographs, and sculptures by 19th- and 20th-century artists the likes of George Catlin, Paul Kane, and Frederic Remington. These artists crafted an idealized interpretation of life in the American West, often times using or creating the iconic images of cowboys and Native Americans that are so familiar to us today. Meanwhile, the American Indian Art collection has pottery from the Pueblo Indians, Navajo rugs and blankets, and blackware by world-renowned artist Maria Martinez. After spending some time immersed in the American West, have a look around the Stark Museum’s Decorative Arts exhibit. This showcase of etched glass and porcelain includes the only complete set of The United States in Crystal, a series of bowls engraved with scenes representing each of the 50 states, Puerto Rico, and the Union. The collection also showcases the works of Dorothy Doughty and Edward Marshall Boehm, who made modeled birds out of porcelain. Finally, visit the Rare Books and Manuscripts collection to see antique texts like The Birds of America by naturalist John James Audubon, along with manuscripts from as far back as the late medieval period. The Stark Museum of Art’s diverse art collection makes it an attraction in Orange that you do not want to miss while you’re in town. Plan your next trip here and you’ll see why touring the museum is one of the top things to do in town.